I have taken Acid-Ease for about 6 years and it is awesome. I have acid reflux and it really works for me. I will continue purchasing Acid-Ease. Thanks for the quick shipping!! 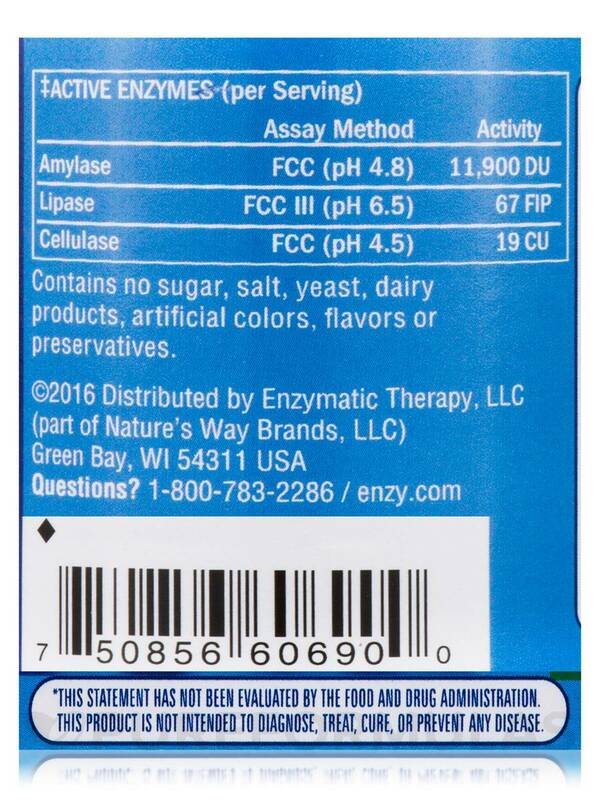 I ordered Acid-Ease by Enzymatic Therapy because I could not tolerate the PPIs and the H2 Acid Reducers. The product so far seem to help me. I have been taking it for a few days. 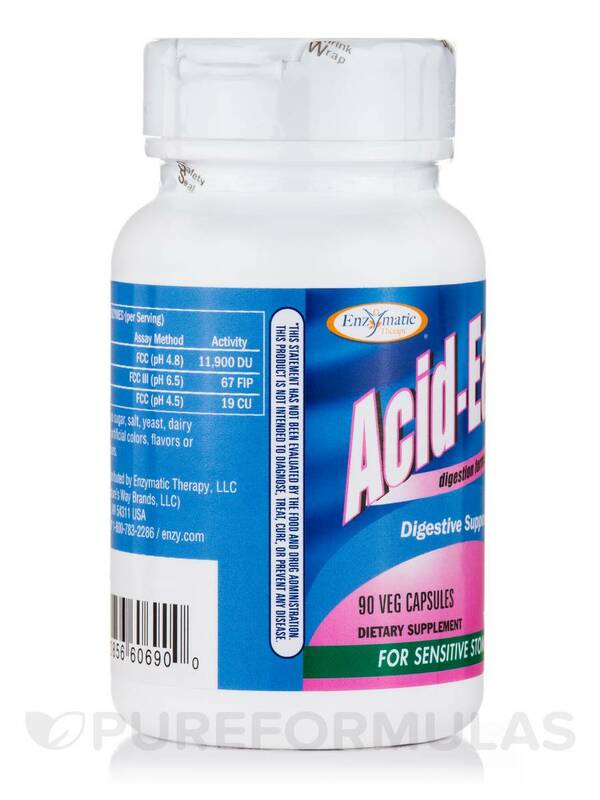 Acid-Ease‚ by Enzymatic Therapy‚ may possibly help promote gastrointestinal health. Marshmallow (Althaea Officinalis) Root Extract: May possibly help provide a protective layer for the digestive tract. Slippery Elm (Ulmus Rubra) Bark: Is believed to help secrete mucous. Gamma-Oryzanol (from Rice Bran): May possibly help promote heart health. Amylase: Could help break starch down into carbohydrates. Cellulase: Might contribute to the enzymatic splitting of cellulose. 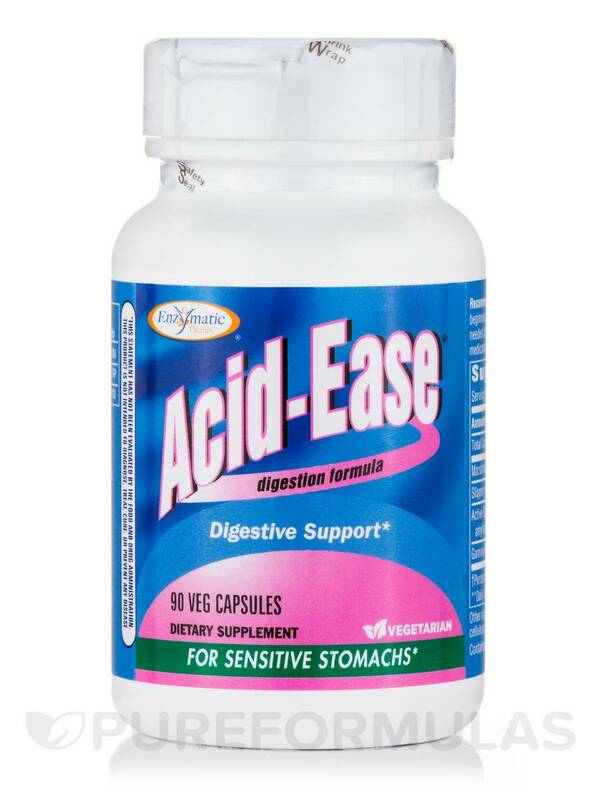 Because Acid-Ease is gluten-free‚ it may be suitable for people who are sensitive to wheat. 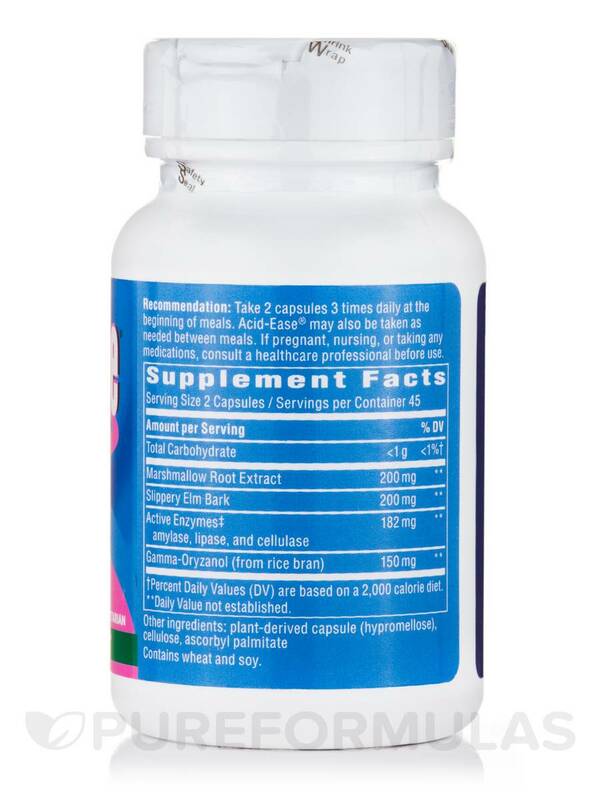 One of the most notable ingredients in this formula is the marshmallow root extract. It may possible help improve peristaltic movement‚ which supports proper digestion. 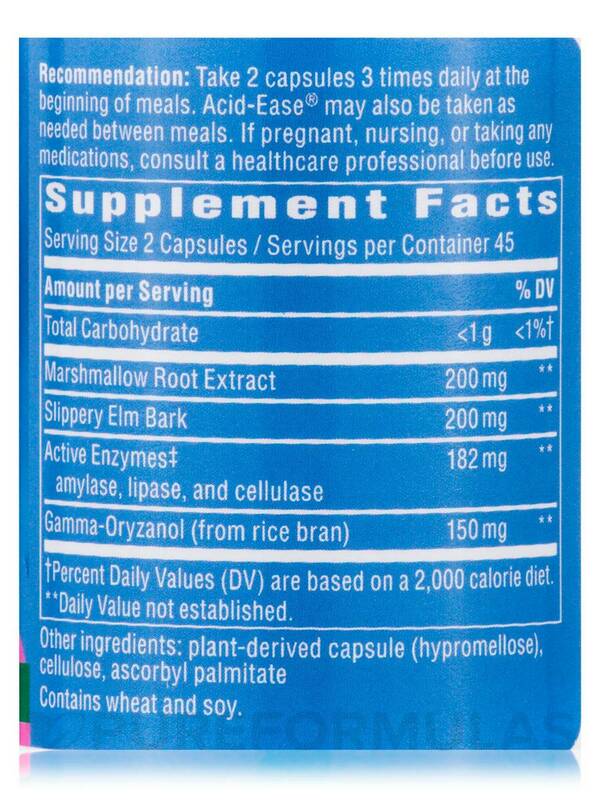 Marshmallow root extract is also believed to help provide a protective lining to the intestine for acid protection. The protective layer might be able to prevent the acid from damaging the intestine. Other Ingredients: Plant-derived capsule (hypromellose)‚ cellulose‚ ascorbyl palmitate. Contains no sugar‚ salt‚ yeast‚ dairy products‚ artificial colors‚ flavors or preservatives. Allergen Caution: Contains Wheat and Soy. 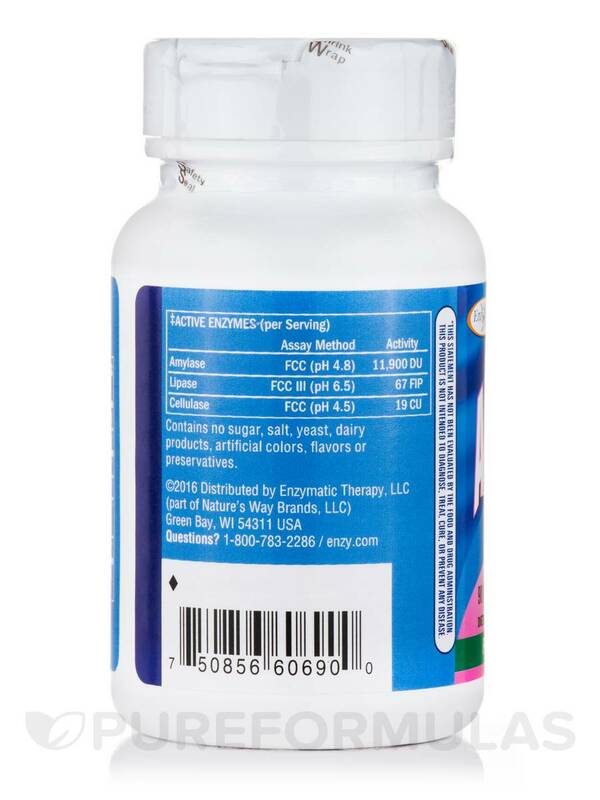 I like that Acid-Ease combines enzymes and herbal product in one capsule. I do not like to take pills every time I eat. switched a couple of years ago we noticed we are alot less gassy. we take 2 with every meal and it helps with our overall digestion. we dont leave the house with out it!